Golly, a Houston-area politician not living in the district — I’m shocked, shocked! Actually I am shocked there is a suit…of course with an unrelated agenda. I hope all the other non-resident politicians get subpoenas to discuss their examples. At least Dave spends some time in the area of his apartment. A final thought on the HCC issue. A 24-year incumbent doesn’t lose an election unless his constituents want him to. The issue isn’t that they didn’t know what Dave Wilson looked like, it is that they didn’t know what Bruce Austin, their elected representative, looked like! He was a long-term fixture and Chairman of an institution that had clearly become dysfunctional. Some politicians deserve to be fired. 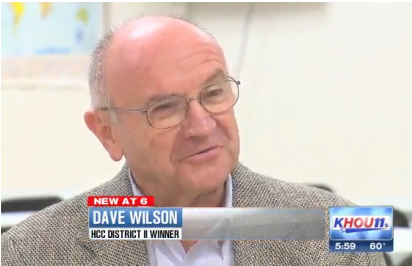 I think it is a day late and a dollar short to throw Dave Wilson out of his seat after he won the election. His opponent probably wanted him on the ballot because he thought it was an easy win. You cannot have it both ways. The time to have vetted Wilson was when he was filing for office, or even running for office. At this point, what should be done? Does the Harris County attorney feel it’s in the taxpayer’s best interest to put a few detectives on the case, seeing where Wilson spends his nights sleeping? How much taxpayer money will be spent playing politics, because the Harris County attorney doesn’t like the outcome of a particular race? The guy won, and if you don’t like it, point fingers at 1) the vast majority of citizens who could have voted, but did not, and 2) the voters who did vote, but failed to do their due diligence, assuming that he was elected by folks who didn’t want to be represented by a guy best known for being anti-gay. Personally, I’d rather be known as the guy who fights for lower taxes, improved streets and drainage, or even just as the guy who fights to prosecute illegal dumpers and clean up the trash dump the city has become. But hey, maybe, those few folks that actually voted, DID vote their moral convictions and chose the guy they wanted. I concur that filing after he won makes no sense considering how many others in similar situations dance around the residency issue so openly. If there was any doubt, it could have been brought up beforehand or as a campaign issue, the truth being that the average voter does not seem to care about it nor do the courts.